You may decide whether or not to let the system automatically add the next stock number, and what that stock number will be. The system automatically updates this number as you enter more vehicles into inventory. You can set a default lot fee for your vehicles here. You can also choose to apply that default to your existing vehicles. This sets a default Down Payment on all of your vehicles. The Down Payment field can be found in the sales tab of your vehicles in Frazer. This allows vehicle costs to be displayed when you open the vehicle information screen without having to click Display Vehicle Costs in the top right. If you are selling a vehicle manufactured in Canada, this option is for you! 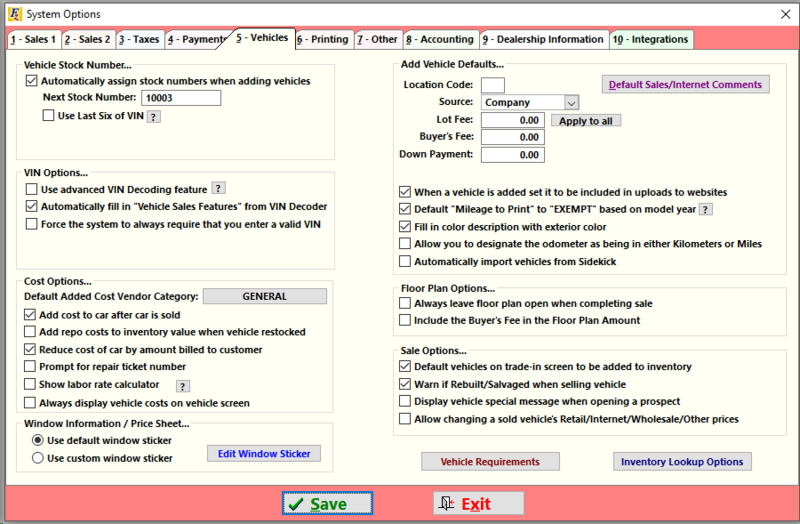 This options allows sales features in the VIN to populate in the vehicle file. These features can be included with uploads and on window stickers. The system will always warn you if the VIN is not 17 characters long. Checking this box will require the VIN to be 17 characters before saving the vehicle. Unchecking this box will allow you to save "invalid" VINs, but still display a warning. If you sell older vehicles or motorcycles, be sure to uncheck this box. This option is checked by default. If you don't use the SiriusXM integration, it can be unchecked to stop Frazer from checking vehicle VINs automatically. Checking this adds a warning to the sales process when you select a vehicle marked rebuilt or salvage. Normally, when completing a sale, Frazer will ask you if you'd like to close a floor plan immediately with a prompt. This will keep that prompt from coming up. Default Trades To Be Added to Inventory. When working a sale with a trade-in, this will automatically check the box to add the trade to your inventory once the sale is complete. Checking this will let you change the Retail/Internet/Wholesale or Other prices on the sales tab of a sold vehicle. Normally those fields can't be changed on sold vehicles. If you write-off a vehicle and add it back into inventory, this option will add your cost of repossession as an added cost on the inventoried vehicle. Checking this will automatically include Buyer's Fees in Floor Plan Amounts. Check it if you prefer to Floor Plan your Buyer's Fees as well as the Vehicle Price. Top of Page. Frazer is integrated with 4 different third parties that offer vehicle history reports. Click an option below for setup information on each one. Frazer is integrated with over 150 Third parties that can help you market your vehicles online and more! - Exclude vehicles that are NOT "Ready to Sell"
(this is particularly helpful if you add alot of vehicles into frazer that you're not immediately ready to market. This button lets you create sales and internet comments that get added to everyone of your vehicles, and there's an option to update every single vehicle with what you enter here. If you use location codes with your inventory, enter a default for them here. This lets you select a default vehicle source. It will be added to any new vehicle you enter. If you want all the vehicles you add to inventory to be immediately included in vehicle uploads, check this box. If you have a vehicle older then 10 years, you have the option to print "EXEMPT" instead of the vehicle's mileage. If you use the Frazer Sidekick mobile app, this setting will automatically import all of the changes you make on the application. Otherwise, those changes must be imported manually using Vehices --> C. Frazer Sidekick.